Is It a Greater Scaup or Lesser Scaup? Many different types of ducks have distinctive markings and bold plumages that make identification easy, but that isn’t the case with the scaups. The greater scaup and lesser scaup are some of the most challenging waterfowl for birders to distinguish between, and there is no single indicator that is clear for either bird. Birders who learn the many tiny differences between the two birds, however, can gradually become proficient in telling them apart. Size: True to its name, the greater scaup is the larger bird at 18 to 20 inches in length, while lesser scaups are 16 to 18 inches long. While size can be challenging to judge in the field, this can be a useful comparison in a mixed scaup flock or when comparing to other duck species where the sizes are known. Bill: Both scaups have similar bills, but close observation will reveal differences, particularly for male birds during the breeding season. The greater scaup has a larger, broader bill, and the black tip is more prominent and wider. The lesser scaup’s bill is narrower and the black tip is proportionally smaller and thinner. 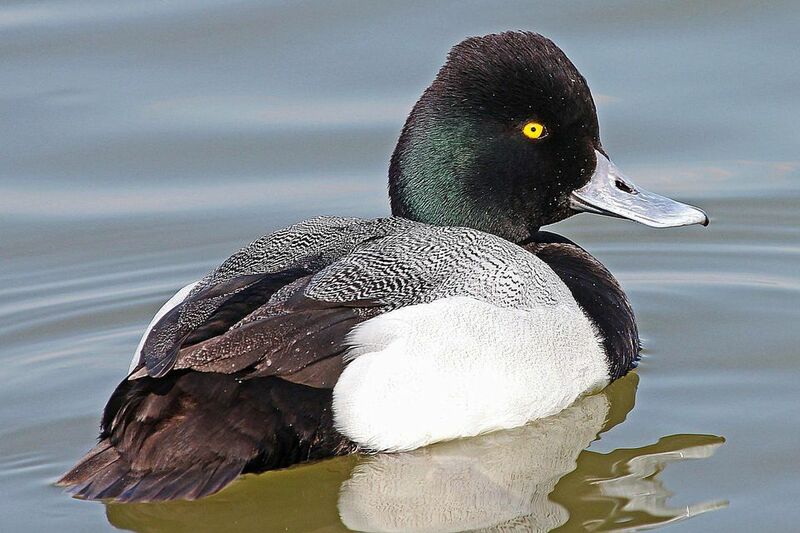 Head Shape: While ducks can vary the shape of their head depending on posture and activity, comparing resting birds can show differences between the scaups. The greater scaup has a more rounded head and nape, with the highest point of the head closer to the forehead. The lesser scaup has a straighter neck and more oval head with the peak further back, and a resting lesser scaup will show a notch or corner toward the back of the head. When viewed from the front, the greater scaup has a more triangular, broader head compared to the narrower head of the lesser scaup. Iridescence: In bright sunlight and at the right angle, the greater scaup may show green iridescence on its head and neck. The lesser scaup may also show green iridescence but can also show purple, which is never seen on the greater scaup. Plumage: From a distance both scaup species have nearly identical plumage, but careful comparison will show differences. The greater scaup has narrower barring on its back, and the barring rarely extends onto its white flanks. The lesser scaup, on the other hand, has heavier barring that frequently extends lower on the white flanks. Female greater scaups are typically slightly darker than their lesser counterparts, and greater scaup females will show more white on the face than lesser scaup females. Wing Pattern: If seen in flight, the amount of white on the wings can help birders tell the difference between scaups. Greater scaups have more extensive white on their primary and secondary feathers that extends nearly to the tip of the wing. Lesser scaups have white only halfway along the wing before it fades to brownish gray. At rest, the white on greater scaups’ wings may be visible, while this is rarely the case with lesser scaups. Range: As with many species, the birds’ range can be a strong clue to its identity. Greater scaups have a more northern range and are more likely found in saltwater marine habitats and larger bodies of water. Lesser scaups are more common in freshwater areas and smaller bodies of water such as park ponds with a range extending much further south. Furthermore, greater scaups can be found in Europe and Asia, while lesser scaups are confined to North America. Family Groups: While both scaups nest in extremely northern habitats, birders who are fortunate enough to observe nests may be able to identify the bird species based on the growth of the hatchlings. Greater scaup hatchlings make their first flight approximately 36 to 40 days after hatching, while lesser scaups take longer to mature and make their first flight at 45 to 50 days. Identifying scaups in the field can be a great challenge, but it is possible. Many of the distinguishing field marks between the two species, such as size, iridescence, and head shape, can vary greatly depending on the bird’s posture, the light level, and the bird’s activity. Furthermore, there is much overlap between the species in terms of bill shape and coloration, plumage, and wing patterns. While this can be discouraging, determined birders will see it as an opportunity to sharpen their identification skills whenever they’re confronted with an unknown scaup duck. For the best results, try to observe several different birds in the same flock, as scaups are social birds that can congregate in large numbers. Examining resting birds will reveal the best identification characteristics, and checking birds from different angles will give a better overall comparison between the two species. Even with the most careful observation, it is not always possible to be positive about scaup identification. With practice, however, birders can be reasonably confident about which scaups they see. How to Tell Western Grebes and Clark's Grebes Apart - Easy Tips!